Bolero and Sleepyhead hard at it at the start of the Plastic Classic. Both of them have new mains with long "SCORA" battens which make sails last longer. Both mains seem to be loose footed, too. For an explanation of SCORA battens, and more, see the article History of Battens, inside. This year's Plastic Classic Regatta race for the Triton Perpetual Trophy saw Ely Gilliam's seven consecutive time winner Bolero upset by Dogstar (crewed by Larry and Joyce Suter, Roy Johnson, and Steve and Charlene Swierkowski). Ely and company were on the way to giving a new meaning to the "Perpetual" in the trophy's title when something happened. We're still not sure. But what can we say besides, "Hooray!!! Finally!!! Free-at-last!! Ding-dong the witch is dea..." (Oops, getting carried away here.) For a summary of how Dogstar went from Fleet Slug to Contender, see the next page. Also winning at the Classic were Rob and Marilyn Squire who took two third places at the Concourse d'Elegance with their Head Over Heels, #96. Since they were unable to hang around for the trophy party, their medals were picked up by Tom Newton. We spoke with Marilyn earlier tonight to find out more about the awards and what they've done to Head Over Heels to earn them. Over the phone Marilyn said, "what, we won something? Medals? I didn't know that!" Anyway, in the spirit of giving people the benefit of the doubt, we suspect that Tom is planning to have the Squires receive their awards at the Fall Dinner. Aren't you, Tom? In all, six Tritons showed up for the Plastic Classic. Veterans Sleepyhead, Viking, Bolero, Dogstar , as well as Head Over Heels and the "Ebbtide-blue" #257 Leo sailed by Stefan Brustowicz. Put this Triton rendezvous on your calander for next year. The date for the 28th Triton National Regatta has changed to September 25, 26, 27, 1998. It's being hosted by the Chesapeake Bay Triton Fleet at the West River Sailing Club in Galesville, MD. On Thursday, September 24, there will be course familiarization with a skipper's meeting at 7PM. On Friday there will be two races, Saturday, two more races and on Sunday, one race followed by the Awards Presentation. The Regatta Chair is Jack Hayes 1003 Landon Lane, Arnold, MD 21021 (410-349-8762). The San Francisco organizer is Racing Fleet Captain and Reigning National Champion Ely Gilliam. If you're interested in finding out more about the Nationals, give Ely a call, 415-282-7106. For maps and more info about the West River Sailing Club, it's yours for the webbing at http://www.netcom.com/~suter/nationals.html . In the first half of the 1998 racing season Bolero has taken what appears to be a commanding lead. Bolero, Sleepyhead and Hulakai have started in all six races and Bolero has five firsts. Wow! Alex Cheng's Hulakai seems to be second with Sleepyhead of the Kuykendall/Golden syndicate just one point behind (and would move ahead with a throw-out). But wait a minute, it's not over yet. During the mid-summer break Alex was searching for a new genoa, so look for trouble here. Hooke, in the one race they matched up with Bolero, won big. And both Sleepyhead and Dogstar have been ahead of Bolero at the end of long weather legs. Stay tuned. For a race-by-race summary of the '98 Triton season, look at the web page on http://www.netcom.com/~suter/race98.html . Finally, save this date: Sunday November 1, our Annual Fall Dinner. Last year's Happy Hour and Dinner at the beautiful San Francisco Yacht Club in Belvedere was so successful we decided to do it again. More info will be mailed early October. 1994- Clueless: Decide to try out the Plastic Classic. Roy and I sail over and hang out at a dock near the Bay View Boat Club waiting for the start. At 30 minutes to go we casually glance at the instructions and realize "the start line's way out there!". Motor like crazy to the start, arrive in the nick of time. We are totally slaughtered. Nearly drift into metal bouys twice. Couple of boats from other classes quite obviously are steering clear of us. "Gee, I thought we knew how to sail". Can't imagine that all these Tritons are so incredibly faster than us. Bolero musta beat us by a leg. Over beers at the party, we vow that next year we'll have a clean bottom instead of a marine preserve. Oh, and read the instructions. 1995- Who's that? : Ely later said, "We saw your old, dirty sails and figured you weren't serious". But the bottom was clean, Dogstar now had a vang and Roy, an old Seattle racer, remembered to read the instructions. We lost a bunch on the short weather leg, got lucky on the next downwind leg and were right on Bolero's stern for the third, long reaching leg across the bay. Bolero's crew kept looking back with this, "who are you guys?" look all over their faces. They couldn't shake us 'till weather leg when they blew-us-away. We duked it out with Viking and Answer for 2nd. Mike Borgerding finished second on the shortened course but everyone appeared to be going around again; nice day for a sail. We followed, Dogstar just beat Viking and Answer on the next, unofficial leg. A gracious Mike let still-clueless us have the second place medal. Over beers at the party, we vow to replace the original equipment mainsail. 1996- Honest 2nd: With our new main we kept up with Bolero thru most of the first three legs, again making up on reaches what we'd lost on the short weather leg. As we inched past Sleepyhead on the 2nd reaching leg they asked "where'd you come from?". Once again Bolero blew us all away on the weather leg but the great race was Sleepyhead, Viking and us. At the very end of the race we ended up crossing Sleepyhead's bow on starboard tack, did our best imitation of tacking on top of them and took second by a boatlength. What excitement! Over beers, at the party, we vow to get a new working jib. 1997- Ralph: With our new jib we thought we were going to be hot stuff. But 84 year old Ralph Beauregard was there in Rascal II. Ralph totally blew away the fleet on the first leg. Didn't know a Triton could be that fast. Incredible. Meanwhile, we couldn't point with our new jib, we were sagging to leeward and couldn't figure out what's wrong. We barely took third, Bolero was first and Sleepyhead second because Ralph had to drop out with a broken boom. Over beers at the party, we vow to figure out how to make Dogstar fast. Like Rascal II. 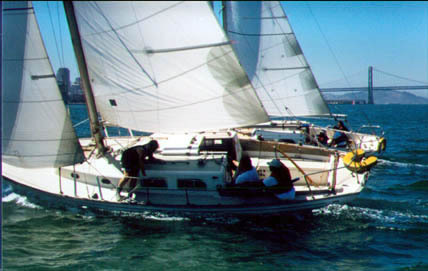 1998- Bunch of little things: After the '97 race we started applying what we'd heard about backstay tension. Wow! Did that ever help pointing! Spoke with Ralph on going fast (see interview in http://members.tripod.com/~suter/dec97/decone.html ). Tom told us how to operate the traveler we'd installed. Found out during the haulout that, oops, we'd been off 90 degrees in hiding the prop in the rudder aperture. Reduced windage; moved weights out of ends; started saying "please" and "thank you" to the crew. All these things help. Dogstar won, and over beers at the party we kicked-back and celebrated. A long time ago, people who were making sails found out that if an edge of a sail was not supported by some type of spar, like a mast or yard, it had to have a hollow cut into that to prevent it from flapping in the breeze. But sailors have also always been looking for "a little more area." Some bright person found that by adding skinny little sticks, which lived in pockets on the sail and were placed roughly perpendicular to the edge, they could begin to cantilever sailcloth out past the straight line defining the edge of the sail. The sail was getting bigger! If we roll time forward to when people were trying to handicap sailboat performance for racing by measuring the hull and the rig, it should be no surprise that batten lengths were of interest to the rule makers. It had been understood for a long time that longer battens allowed sailmakers to build mainsails (or jibs for that matter) with wider girths. The original attempt to limit girths was done via limiting the batten length. A sailmaker could make a mainsail as wide as she liked, but with the short battens of CCA and early IOR rules, the leech would fall off to leeward, yielding a slower sail. There have been some highly imaginative attacks on the mainsail midgirth problem. One of my favorites was the mast with a huge permanent bend way up near the top. This effectively moved the headboard way aft from its "normal" position, allowing/requiring the sailmaker to put in a huge amount of "roach" (actually luff round) in the luff edge of the sail instead of the "normal" roach on the leech edge. In this way the sail ended up with a massive midgirth, even though it still used short battens. The obvious solution to the midgirth problem is simply to measure the girth on the sail itself, which is what the rule makers eventually decided to do. What went wrong was that they did not go back and reassess the batten lengths, which were left unchanged from the earlier rule. So along comes SCORA, the Southern California Ocean Racing Association. They were asking themselves "Now that the size of the mainsail is strictly limited, what can be done to make the sail last longer?" Why is it that after a year or so the sail develops a deep crease, or "V" at the front of the top batten? And a few years after that, the crease runs down past the front edge of all the battens? It looks ugly, and certainly goes slow. A bad combination. So these SCORA folks started messing around with batten lengths. Part of their study involved retrofitting longer battens onto old, tired mainsails. They found that the back edge of the sail showed a huge improvement in shape. Basically, the number of yarns which had previously done all the work grew by the percentage increase in the length of the battens. At the location of the number 3 batten (counting down from the top), the SCORA length is double the old CCA/IOR length, so each yarn is doing half the work it did before! Simply fitting the longer battens into an old, tired sail removed the crease, flattened the leech, and moved the draft forward: an altogether healthy combination. IMS eventually was forced to lengthen their batten limits also, although regrettably they refused to simply adopt the SCORA lengths, but instead came up with their own maximums, slightly shorter than SCORA. And they still kept their huge rating penalty for battens longer than the maximums. They have trouble with the notion that batten length is not a speed producing factor. Speed comes from two things: sail shape and sail size. They have a good handle on controlling the size. Batten length does not really improve the shape of a brand new sail, it just keeps an older sail looking new longer. This is not something to penalize. The idea of full-length battens is certainly not new. If you have ever seen a picture of a Chinese junk, you know full-length battens have been around for thousands of years. However, the application of full-length battens to modern displacement boats with sloop rigs is relative new, at least in large volume. The remainder of the article will discuss the pluses and minuses of full-length battens versus sails without full-length battens. This history was lifted from a longer article on full length battens that appears on the Pineapple Sails web page. Kaholee, #158, World's Most Landlocked Triton.